Rare offering of a beach front Hampton home with pool, spa and tennis. Located in one of the most desirable neighborhoods in the world on the most beautiful beach in the world. Some call Meadow Lane Billionaire's Row, I call it home. Take a morning dip in the ocean or swim some laps in the 20x40 Salt water swimming pool. Maybe jump in the large, no chemical hot tub. Enclosed Hot Shower outside, Wood Fired Pizza Oven and Smoker, Propane BBQ and lots of lounge chairs make outdoor living easy. Enjoy the cabana set on the "litte beach" right off the deck, with drapes for sun management. Or take your private walkway right onto the surf. Recently remodeled gourmet kitchen with 6 burner stove and new stainless steel appliances. Luxury sheets and towels. Place mats, cloth napkins as well as complete Lobster Service for 8. Dining room seats 10 with dishes and glassware. Fully equipped kitchen for cooking at every level. Pet and kid friendly. Perfect for a family reunion or entertaining. Upstairs find Gourmet Kitchen, living room with vaulted ceilings, dining room and the Master Bedroom with King Sized Bed (TV with cable) and Master Bath. Master bedroom has its own private deck overlooking Shinnecock Bay as well as a picture window with spectacular view of the ocean. Living room has large screen TV, DVD, cable with DVR, XBOX 360, Apple TV and games. Huge Fireplace with wood. Views of the ocean and Shinnecock Bay. You can't look out the window without seeing water. Guest Bedroom 1 has King Sized Bed, TV with cable, ROKU and DVD and opens to the Pool. Guest Bedroom 2 has a King Sized Bed, TV with cable and opens to Pool. Guest Bedroom 3 has a full sized bed, TV with cable. Guest Bedroom 4 has 2 full sized beds and TV with cable, For a total of 3 Kings Beds, 3 full size beds. Cabana room features 9 foot long overstuffed couch with 32' TV (cable and DVD) for relaxing while watching the kids swim, opens to Hot Tub area and Pool. Downstairs are two bathrooms, one with double sink, tub and shower. One with glassed in shower. Outside Shower offers privacy and hot water. Eat inside or out, both seat up to 10. Hammock and lounge chairs for afternoon naps. Enjoy air conditioning or open up for ocean breezes. Electric Pool Cover for safety. Gate at top of stairs for child and pet safety. This house was build for comfort and fun. This is our 2nd home, where we spend more than half of every year. Come and enjoy the rarified air of the Hamptons. This isn't a mansion, its a really nice beach house. No precious antiques to break. Bring the kids. Bring the dog. Relax and enjoy. The house is located ON THE BEACH as well as across the street from Shinnecock Bay. Water views all around. There is a special, magical feel to this house. We're also one of the few pet friendly homes in Southampton. Pet's of any size welcome! Walk right onto the beach or cross the road to beautiful Shinnecock Bay. The light that streams into the dining room and living room at sunset defies description. Its truly magical. A ten minute drive to famous downtown Southampton. 90 minutes from NYC. Very few homes are for rent on the beach in the Hamptons. Come and enjoy the rarified air of the Hamptons. Gorgeous water views from every room upstairs. Beach on one side and Shinnecock Bay on the other. We are right on the beach. This stretch of the beach is considered one of the top beaches in America. Maintained meticulously by the Village of Southampton. The ocean is right here, views from front of house. This home is located on the beach. Walk down a wooden path to the sand. Views of both the beautiful Atlantic Ocean on one side and Shinnecock Bay on the other. Sunsets are amazing, washing the house in orange lights. Dual Controls for upstairs and downstairs. All best quality sheets and towels. Loads of bath and pool towels. Keurig as well as French Press and espresso maker. Its all here. Ready to entertain. Serve 10 easily. Eat in or outside on full sized dining room tables. Basic cable with DVR. Cable in 6 rooms. Always a nice selection of reading. Possible car available (Toyota Highlander) with coveted beach pass. "12" women could not have been happier. Shelby's home was perfect for us. Beautiful view of the ocean from the kitchen and deck, a short walk to the ocean from the house. We walked every night on the beach to see the sunset. Cooper's beach is also close. The bedrooms and beds were comfortable. The house looked exactly like the pictures. The hot tub is large, we used it every night, the pool is large and wonderful too. Anything we needed for our stay was there. Shelby went above and beyond and above and beyond again to make sure our stay was perfect. Southampton is a good location in the Hamptons also, main street shopping and several good restaurants. We toured all the Hampton towns from there. I would recommend this house to anyone wanting to see the Hamptons and they want to be on the ocean! Most of us were from the midwest so the ocean view and ocean front was an absolute. I'd go back tomorrow. We rented the property for the last two weeks of August 2014. It seemed like the pine trees were whispering a welcome to us as we drove down the driveway, past the tennis court to our rented beach paradise! The bedrooms were lovely, comfortable and fully appointed. The owner, Shelby, obviously tended to every detail toward making our stay a happy one! There were plush towels for bath and pool, sitting areas upstairs and down, comfortable beds and upstairs the sitting area was well thought out and ultra comfy! Kids of all ages (mine are all grown) love this place -- there is plenty to do from swimming, tennis, beach going, TV (movies included), and Wii games galore. We enjoyed sitting poolside books in hand, lulled by the sound of waves hitting the beach and the trees stirring in the breeze. The views were stunning -- ocean from the back of the house and bay from the front. It couldn't get any better than this!! The garden beside the pool is beautifully planted along with the potted plants and hanging blooms along the upper and lower deck including an herb garden ready for the picking! From a cook's point of view (mine!) the kitchen was the best room in the house! It had a GLORIOUS view of the ocean and it was fully appointed with Le Creuset pans and a complete china set and every gadget a cook might need! The owner clearly loves this house and as guests, we did too! She was responsive to our every request or question and provided us with special extras we were not expecting! Our group of 5 and two golden retrievers would very, very happily return next summer!! Thank you so much, it is my pleasure to have families and animals enjoy the property. Come back soon and often! I'm so pleased to be given the opportunity to share our Thanksgiving 2012 holiday experience in this most beautiful beachfront home. Being from Miami originally, and now spending a large part of the year in New York City, we were looking to celebrate the holiday near the beach, which we miss very much. We have rented from VRBO in the past with wonderful results. However, this sojourn was truly remarkable. After searching various locales, this home met all of our criteria. I was keeping my fingers crossed that it would be available for Thanksgiving. From the moment the owner and I began e-mailing it was readily apparent to me that this was a truly special person and home. There was not one thing that was overlooked, the attention to detail was amazing. Pictures do speak a thousand words that is true; but that would not be enough to adequately describe the breathtaking beauty of the location, the home and its welcoming charm. Here are just some of the most memorable things the home offered to my family (3 grown children, a grandaughter, my husband and our dog): utmost tranquility and seclusion, a dream kitchen with a National Geographic view of the ocean, fabulous stove, every cooking tool, beautiful fireplace, super duper washer and dryer, sunshine streaming through every window, picture perfect views of the Atlantic and the bay from the master bedroom, as clean as I keep my own home, beautifully decorated, furnished and appointed in a true beach feel, so 'user friendly' to all ages (dogs included!) with tile floors and cushy, cushy couches, decking and paths that made traversing the property so easy, a great tennis court (even in 38 degree weather), a private beach adjacent to the pool area perfect for a two and a half year old to play with grandma and grandpa while her parents watched from the kitchen, natural foliage galore, the sound of the ocean and the wind, the beachfront just over the gorgeous dunes right at the back door and the lovely ride along the road to get to the house. I literally could go on and on. This was beyond perfect for my family. And, I haven't even begun to sing the praises of the remarkably attentive owner who was just a joy to deal with before, during, and after our stay. She truly made our experience that much more memorable. We would not hesitate an instant when thinking of staying there again. Which, we began to speak about on our drive home! AMAZING LOCATION, AMAZING HOUSE, AMAZING OWNER - how can you say no?! My husband and I were planning a last minute trip to Hamptons in September, and we thankfully came across this listing. pictures don't do it justice. 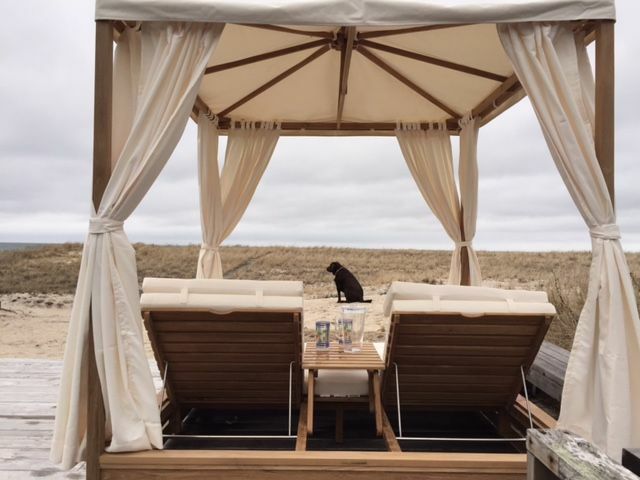 literally the perfect house in the BEST location in the hamptons - right on the beach with every single amenity possible, and it just feels like home. You want 8 rafts for the pool (heated to feel like a warm bathtub)? no problem. enough beach towels to cover the entire section of the beach behind the house (and this is not a small beach by ANY means)? done. Apple TV? OK! Wii with guitar hero and four guitars? Sure! Gourmet kitchen with every imaginable cooking/baking need and amazing appliances? Check! I could go on and on . . .
On top of all this, the owner is an incredible woman. We took our 2 year old with us for our trip, and she left toys to play with. She has a notebook in the house with every detail covered - from how to use the washer/dryer (or spaceship as she likes to call it) to the TV channel listings to the best restaurants in the area to the neighbors phone numbers in case of emergency. No stone left unturned! And she would always check in on us to make sure we were enjoying ourselves. HOW COULD WE NOT?!!? Our daughter had so much fun, that if you ask her where she is from, she says 'hamptons.' We will definitely be returning to this rental next summer!! To the owner - if anyone wants to contact us for a reference, please pass on our email address! !